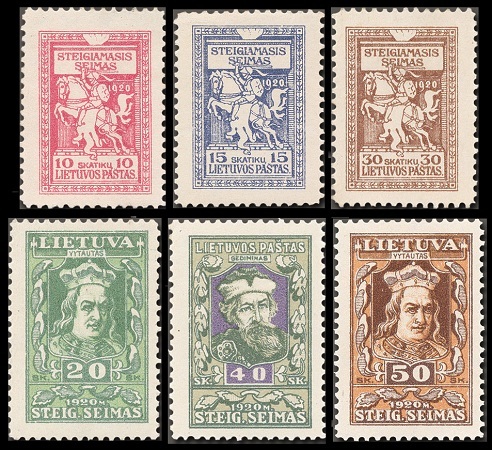 Finely produced, symbolic definitive Lithuania stamps were introduced in early 1919, and they featured the White Knight or Vytis from the Coat of Arms of Lithuania. 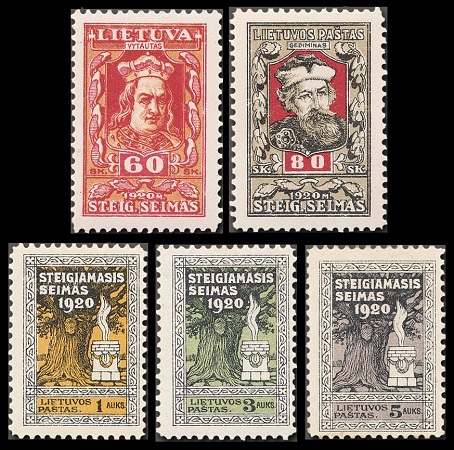 The first pictorial commemorative stamps of Lithuania appeared in early 1920. 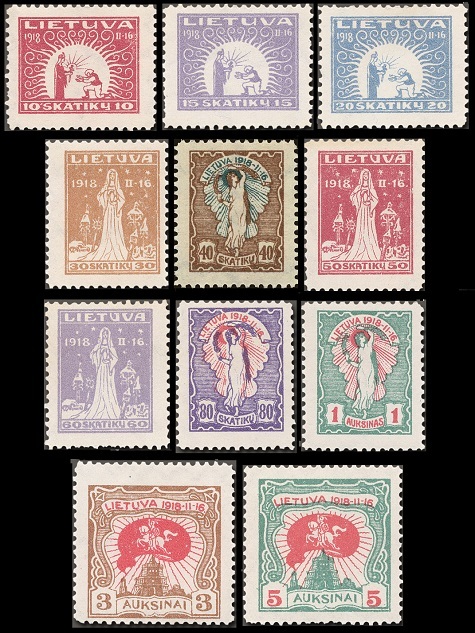 The eleven major-type definitive Lithuania stamps shown above were produced, in four printings, between 1919 and 1920. They were lithographed by the H. S. Hermann Printing Co. of Berlin, and they were printed in panes of 100 stamps. Paper, watermark, and perforation varieties are described in the tables below. The common design of these new definitive stamps features the White Knight or Vytis, from the Coat of Arms of Lithuania. This White Knight was originally the heraldic symbol of the Grand Dukes of Lithuania, and it represents Lithuania driving away invaders. The Scott catalog attributes, for stamps that are printed on grayish granite paper that is watermarked network and that are perforated 10 1/2 to 14 and compound, are as follows. 10 S. (1919 - Sc. #30) - Deep Rose. 15 S. (1919 - Sc. #31) - Violet. 20 S. (1919 - Sc. #32) - Dark Blue. 30 S. (1919 - Sc. #33) - Deep Orange. 40 S. (1919 - Sc. #34) - Dark Brown. 50 S. (1919 - Sc. #35) - Blue Green. 75 S. (1919 - Sc. #36) - Orange & Deep Rose. 01 A. (1919 - Sc. #37) - Gray & Rose. 03 A. (1919 - Sc. #38) - Bister Brown & Rose. 05 A. (1919 - Sc. #39) - Blue Green & Rose. The Scott catalog attributes, for stamps that are printed on thick white paper that is watermarked wavy lines and that are perforated 10 1/2 to 14 and compound, are as follows. 10 S. (1919 - Sc. #40) - Dull Rose. 15 S. (1919 - Sc. #41) - Violet. 20 S. (1919 - Sc. #42) - Dark Blue. 30 S. (1919 - Sc. #43) - Orange. 40 S. (1919 - Sc. #44) - Red Brown. 50 S. (1919 - Sc. #45) - Green. 75 S. (1919 - Sc. #46) - Yellow & Deep Rose. 01 A. (1919 - Sc. #47) - Gray & Rose. 03 A. (1919 - Sc. #48) - Yellow Brown & Rose. 05 A. (1919 - Sc. #49) - Blue Green & Rose. The Scott catalog attributes, for stamps that are printed on thin white paper that is watermarked wavy lines and that are perforated 10 1/2 to 14 and compound, are as follows. 10 S. (1919 - Sc. #50) - Red. 15 S. (1919 - Sc. #51) - Lilac. 20 S. (1919 - Sc. #52) - Dull Blue. 30 S. (1919 - Sc. #53) - Buff. 40 S. (1919 - Sc. #54) - Gray Brown. 50 S. (1919 - Sc. #55) - Light Green. 60 S. (1919 - Sc. #56) - Violet & Red. 75 S. (1919 - Sc. #57) - Bister & Red. 01 A. (1919 - Sc. #58) - Gray & Red. 03 A. (1919 - Sc. #59) - Light Brown & Red. 05 A. (1919 - Sc. #60) - Blue Green & Red. The Scott catalog attributes, for stamps that are unwatermarked and that are perforated 11 1/2, are as follows. 15 S. (1920 - Sc. #93) - Lilac. 20 S. (1920 - Sc. #94) - Deep Blue. The Scott catalog attributes, for stamps that are watermarked webbing and that are perforated 11 1/2, are as follows. 20 S. (1920 - Sc. #95) - Deep Blue. 40 S. (1920 - Sc. #96) - Gray Brown. All of these stamps exist imperforate, and as such, they are relatively abundant and affordable. The eleven commemorative Lithuania stamps shown above (Sc. #70-80) were issued on February 16, 1920 to celebrate the First Anniversary of National Independence. The stamps are watermarked zigzag lines forming rectangles, and they are perforated 11 1/2. Allegorical representation of Lithuania receiving benediction. Allegorical representation of the spirit of Lithuania rising. Allegorical representation of Lithuania with broken chains. Allegorical representation of the White Knight over Gediminas Tower. The eleven commemorative Lithuania stamps shown above (Sc. #81-91) were issued on August 25, 1920 to celebrate the Opening of the Lithuanian National Assembly. The stamps are watermarked zigzag lines forming rectangles, and they are perforated 11 1/2. The White Knight or Vytis, the heraldic symbol of the Grand Dukes of Lithuania. Grand Duke Vytautas (1350-1430), the most noteworthy of the Grand Dukes of Lithuania and the national hero of Lithuania. Grand Duke Gediminas (1275-1341), considered the founder of the Grand Duchy of Lithuania and of its capitol, Vilnius. Sacred Oak and Altar, a pagan holy site where Grand Duke Gediminas is believed to have worshiped. 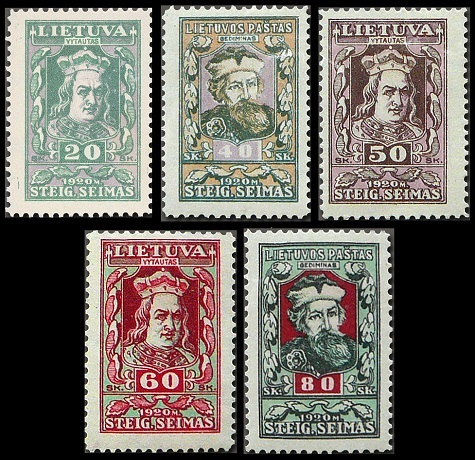 The five trial-printing commemorative Lithuania stamps shown above (Sc. #92-92D) were produced during 1920. 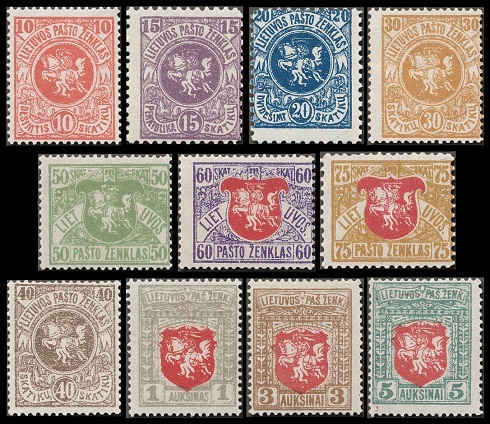 The designs of these trial-printings are identical to those of the same denomination stamps in the Lithuanian National Assembly set issued on August 25, 1920, HOWEVER they are printed in different colors than the regularly issued stamps. Two-thousand sets of these trial-printing stamps were placed on sale at post offices in Lithuania, by order of the Ministry of Posts. They are very scarce today.